I realized I hadn’t posted my roasted garlic technique yet and it is one of my favorite things. It is so delicious and versatile. 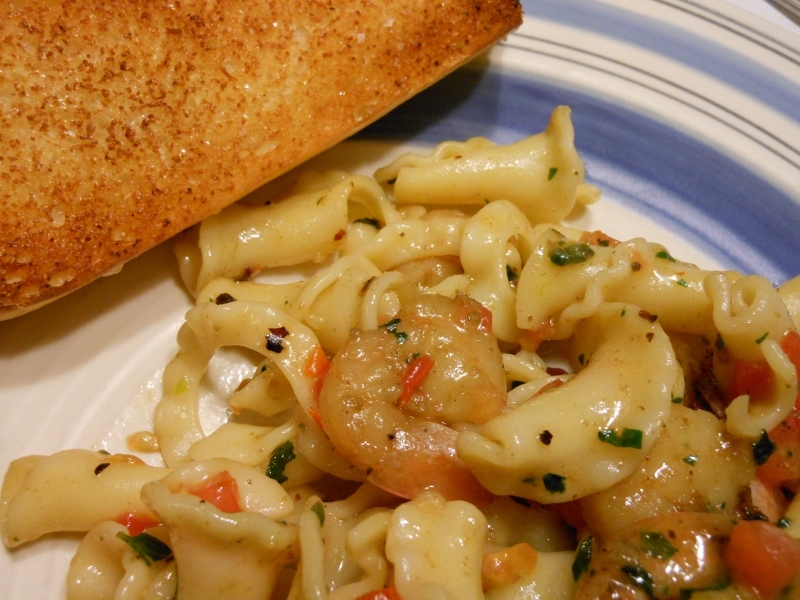 You can add it to any dish you’d use plain garlic in and it’s even great smeared on toasted baguette. Trim about 1/4 inch off of the top of the garlic. Place on foil square and drizzle olive oil over the top. Sprinkle with salt and wrap foil around garlic head. Bake at 350 degrees for about 40 minutes. Allow to cool enough to handle before using. Squeeze near bottom of head to remove cloves from skins. Just a quick and easy post for today. 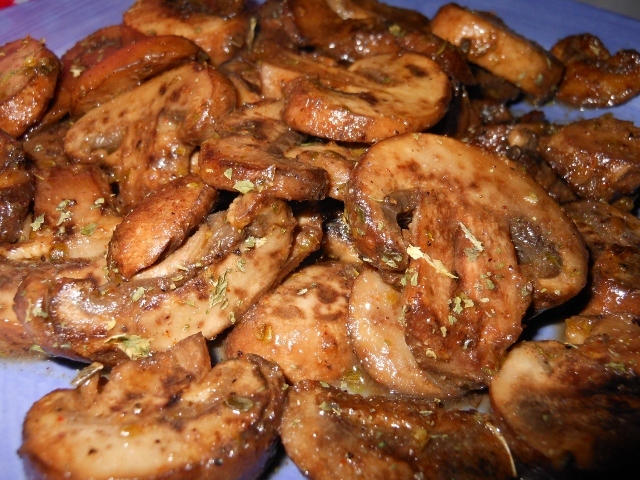 I sautéed mushrooms with a bit of an italian twist. Heat olive oil over medium high heat. 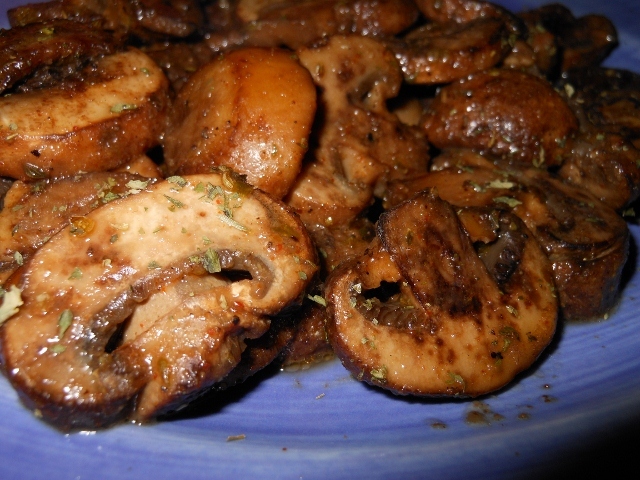 Add mushrooms and season. Sauté for about 5 minutes or until desired tenderness. I managed to sweet talk Charles into fixing dinner tonight. I was worn out from a busy day of prep at work and needed to rest for a bit. It came out fabulously. He’s always his biggest critic but to be honest the only thing I would have done differently (and as soon as he served it he said the same thing) was to remove the shrimp tails first so I didn’t have to pluck them off while eating. Perfect balance of flavor; nicely spicy from the crushed red, so back off a bit for the faint of heart. Basil and tomato always compliment each other well and parmesan is just a perfect touch to just about any pasta dish. Cook pasta according to package directions. 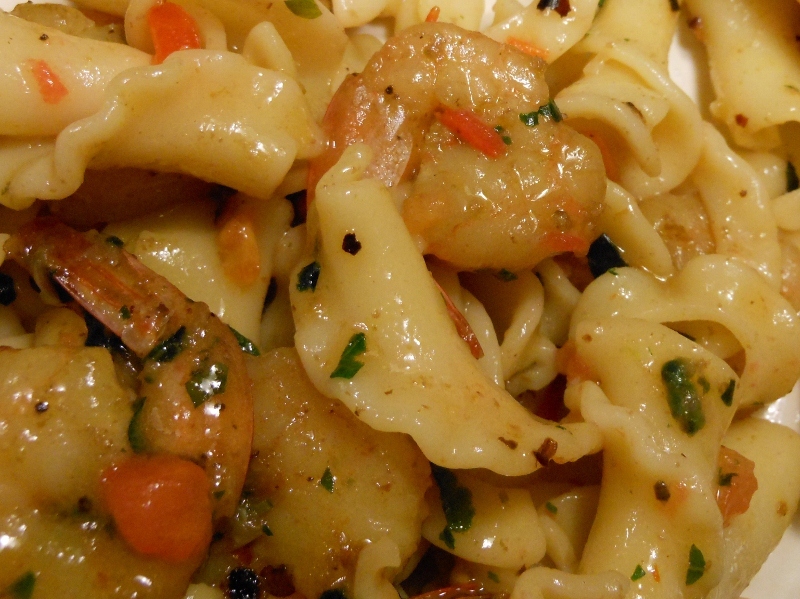 Meanwhile sauté shrimp in butter, olive oil, crushed red pepper and salt for about 3 minutes or until cooked through. Toss with thyme, basil and garlic. Add remaining butter and extra virgin olive oil; toss with cooked pasta stir in diced tomato. Serve sprinkled with fresh parmesan. Just a quick post today. I’m working on some lasagna which I will share probably tomorrow but I must share with your my favorite technique for cutting basil. 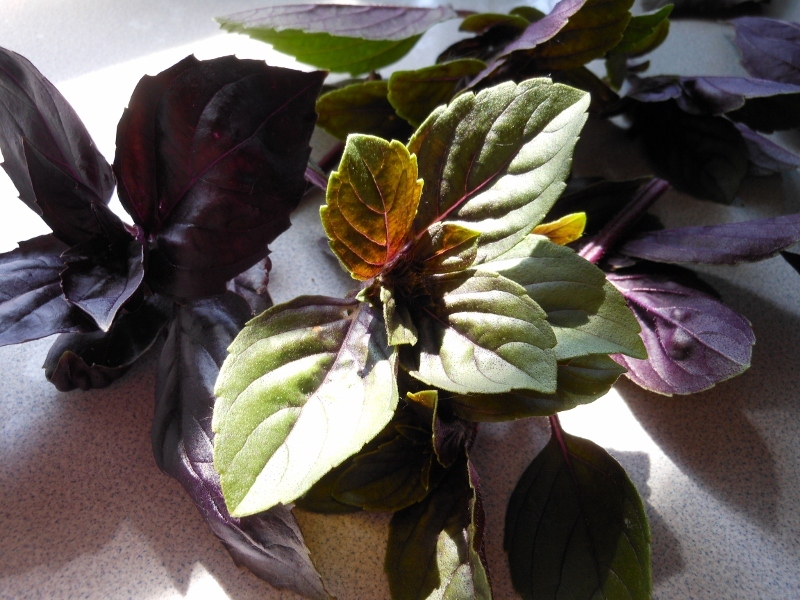 I like to plant a few different varieties of basil; today I used a purple and another that has both green and purple colors. First remove any flowers and stems. Place about a teaspoon of olive oil. This amount will vary based on how much basil you have; I ended up with about a tablespoon of basil so add more oil if needed. You just want to make sure all the leaves are lightly coated. 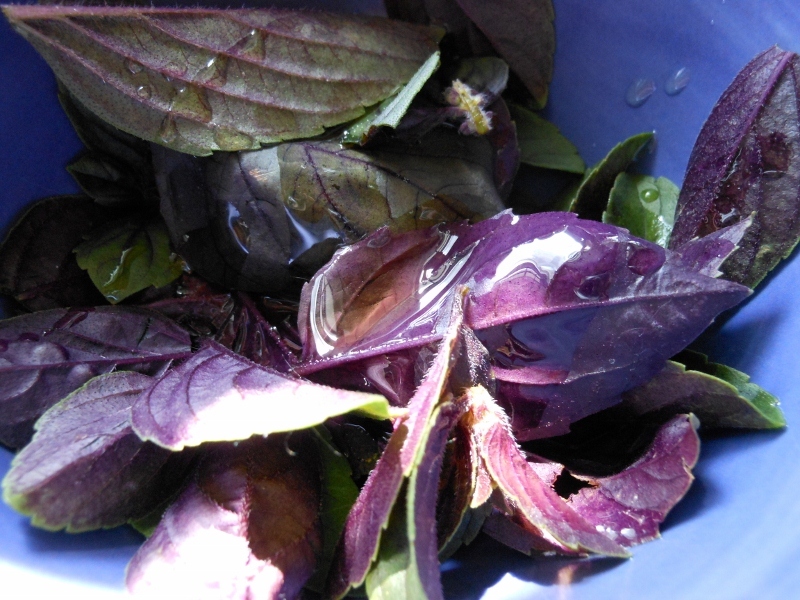 Gently stir around the basil to coat with oil. Now for the next step. 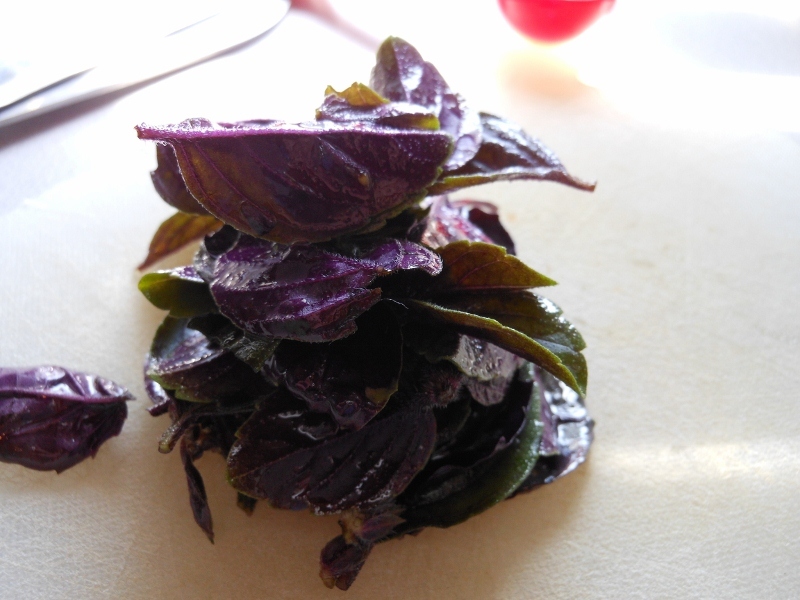 Stack up the basil leaves; and roll up similar to the picture below. 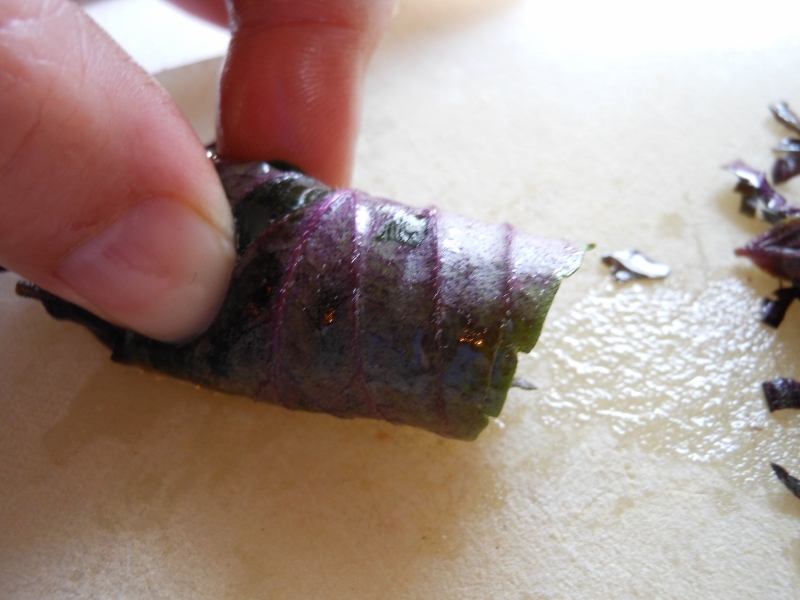 Using a sharp knife slice the basil in to thin strips; chiffonade if you please. 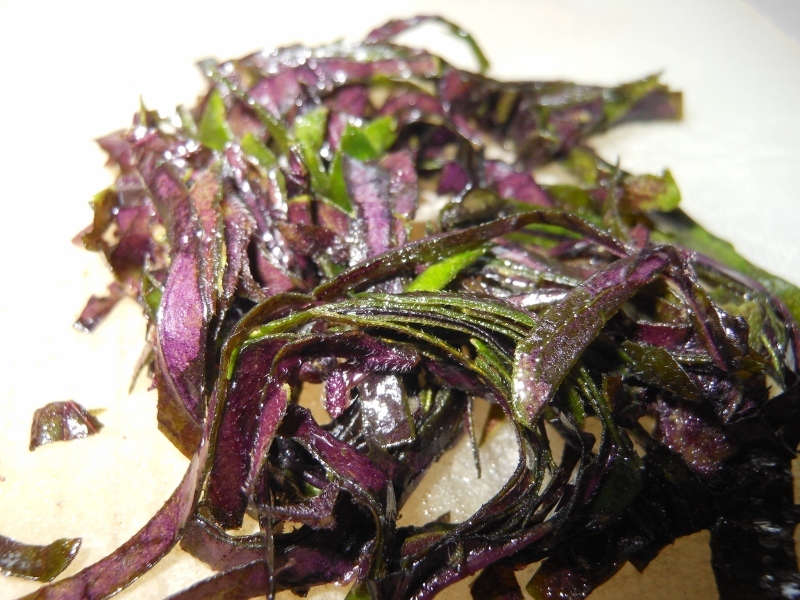 The olive oil keeps the leaves from bruising. and the rolling of the stacked leaves makes short work of the task. 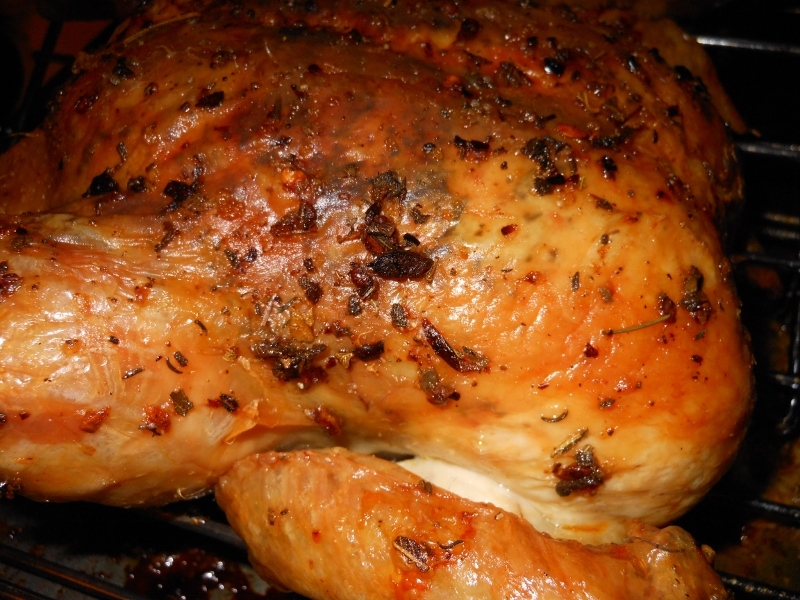 Roasted Chicken is one our favorite dinners. We make it quite a bit but have failed to post a recipe yet. Our seasoning choices vary from time to time. Today we opted for an olive oil and herb combination. Not the prettiest bird ever but oh so delicious. Combine above ingredients in small bowl. 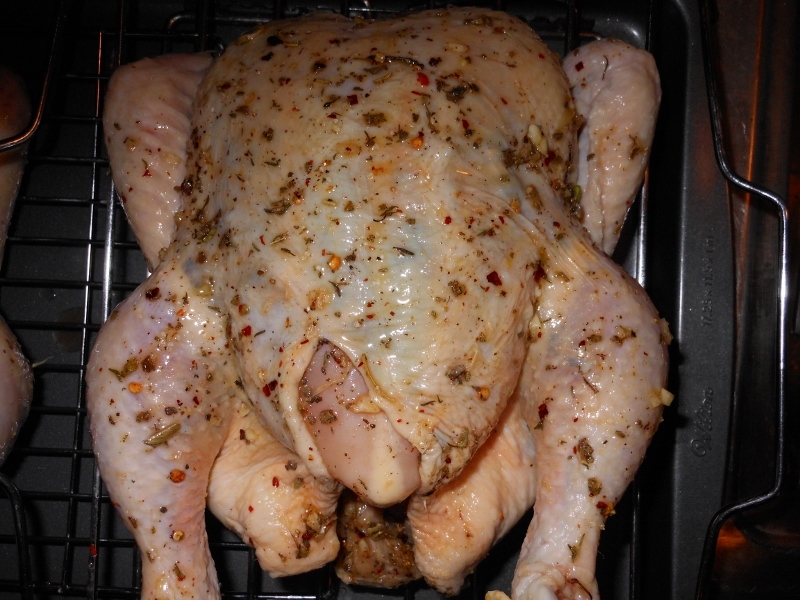 Prep a good-sized chicken (ours was 4 1/2 pounds) by loosening the skin from the meat on the breast, thighs, and legs. Put plenty of the olive oil and herb mixture between the skin and meat. Rub the outside as well. 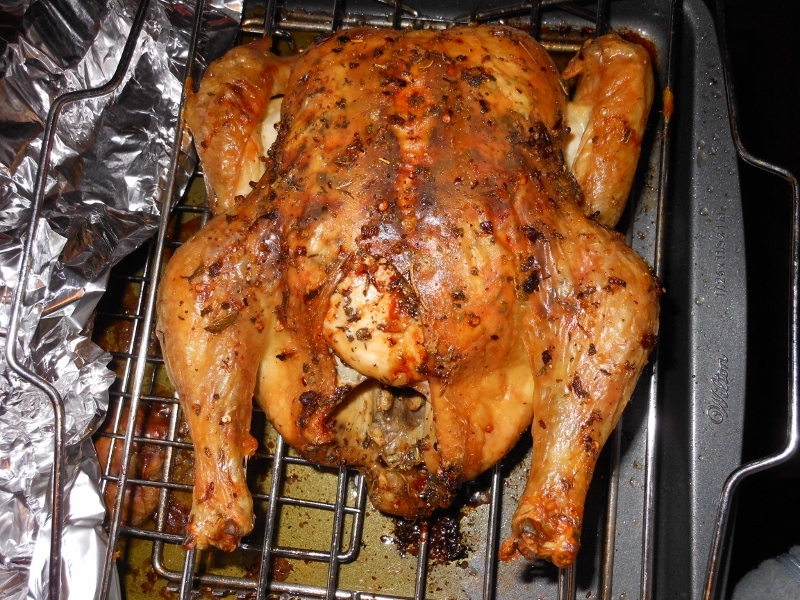 Bake a 4 1/2 pound chicken at 375 degrees for about 1 hour 40 minutes. Adjust time as needed depending on bird size. Allow bird to rest for about 10 minutes before carving.